Hookah Battle – is an unique event (with a long promotional preparation) that has no analogues in the world and gathers attention of all hookah community. Photos (on the background of sponsors’ banners spread throughout the Internet. The event attracts a lots of people, of a narrow target audience – hookah fans. 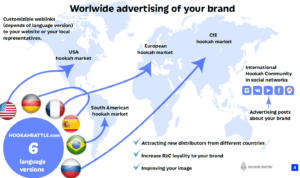 By becoming an official sponsor of the Hookah Battle, you will attract the attention from both ordinary consumers and partners – customers (at the event, there are usually many managers and founders of restaurants and food companies), in addition you can improve the image of your company by supporting such events. We offer efficient and high conversion online and offline advertising. Who is interested to be a sponsor of the Hookah Battle? Retailers, wholesalers, manufacturers and outsourcing companies in the field of hookah industry, restaurants with well organized hookah service.